Matthew Cummings' mouth blown beer glasses are designed to enhance specific brews. Malty Glass: A bubbled form made for malt-rich beers like stouts and porters. Not only is it comfortable in the hand, but when combined with a nitrogenized beer, you can brew up something truly unique: a triple head. For about 30 seconds, the rising bubbles are slowed down by the glass's narrow "waists," creating beautiful, boozy magic. 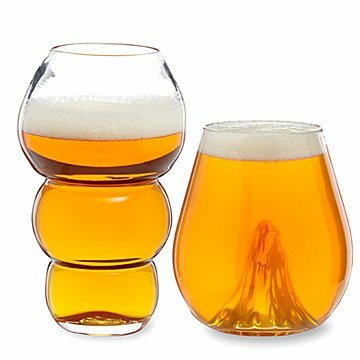 Volcano Glass: Tailored for aromatic or high ABV beers. Drawing inspiration from brandy snifters and red wine glasses, the design has a wide, stemless bowl and a narrow lip, which helps concentrate the aromatic gasses and enhance the beer's flavor. Matthew also enhances the beauty of the piece by adding molten glass at the bottom of the bowl. Resembling the first splash of a good pour, this artistic flourish looks beautiful on display, and seems to rise from the surface of your beer as you drink. Matthew Cummings is a contemporary art, glass and craft beverage fiend operating out of Knoxville, TN. Matthew has a nine years of higher education in glass sculpture, receiving a BFA from Centre College, Post-Baccalaureate from Appalachian Center for Craft, and a MFA from Illinois State University. While not brewing test batches for his upcoming brewery, he is found at his glassblowing/sculpture studio. He leads a dual life, one foot firmly planted in the Contemporary Glass Art scene, and one foot shuffling through the Craft Alcohol/Glassware Design world; while allowing each sphere of interests to inform the other. His functional glassware designs are sculptural in nature, and take into account the physical aspects of consumption; while his artwork slowly unravel layers of detail that encourage everyday interaction. Both realms are heavily influenced by his insistence on research and empirical knowledge. The science of Aesthetics and the science of Taste being two sides to the same coin of human experience and are often interchangeable. This class is beautiful! I had to explain to my husband the artistic and aromatic aspects of it, but once I did, he loved it! Picture doesn't do it justice. My brother loves craft and micro brews so a beer theme gift is always appreciated. I know this glass will be a hit. This glass will be given as a Christmas gift for a young man who likes Belgian and other aromatic beers. I purchased this for my husband for his birthday. As a craft beer lover, he already has a variety of glasses and accessories. The design and functionality of this glass were like nothing we had seen before. He also loves the mountain that rises from the bottom and helps aerate the beer. A big winner!